In 1860, Giovanni Panerai founded luxury watch brand what would eventually become Officine Panerai in Florence, Italy. The store he opened began as a watchmaker’s shop on Ponte alle Grazie, serving both as a workshop and also as the city’s first watchmaking school. The small establishment became an official supplier of watches and precision instruments to the Royal Italian Navy in the 1900s and not long after, created one of its first patents, Radiomir, a radium-based powder that imparts luminosity to the dials of sighting instruments and devices. 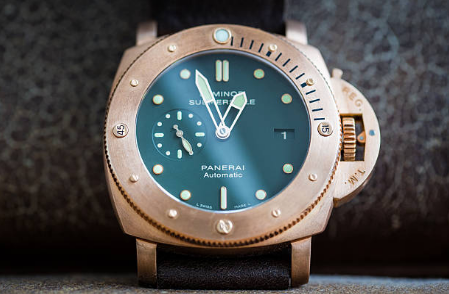 The material’s high visibility and its use in paint provided excellent underwater adhesive qualities make it an integral element in Officine Panerai’s manufacture process. As a tribute to the Radiomir substance, Panerai created its initial design prototypes for the reference currently known as the Radiomir for the Navy on the eve of the Second World War. The watch still retains many of the prototype’s original features; boasting a large, cushion-shaped steel case, glowing numerals and indices and a hand-wound mechanical movement. More than a decade after Radiomir was patented, Panerai had generated numerous other patents, including a new self-luminous material, Luminor, which superseded the Radiomir paste previously used. Panerai continued to produce wrist-worn diving instruments, delivering around 1600 watches between 1938 and 1970, mostly for military and naval use. Approximately twenty years later, Panerai moved to launch its products to the commercial market and was purchased by Richemont shortly after, which positioned the company as a luxury watch brand and increased its retail value. In 1993, it then moved to launch its products to the civilian market. Panerai has become one of the most popular watch brands today, its precision, aesthetic and construction making it a solid addition to horology enthusiast’s collection.